For what can feel like a quiet town, Siena has a vibrant nightlife, if you understand that “nightlife” here is different from that in a larger city. It all starts about 5 in the evening, when suddenly half the town seems to be out strolling the Banchi di Sopra, window-shopping, eating gelato and catching up with friends and neighbors. This is the daily passeggiata, in which people are out to see and be seen, often wearing their most trendy or elegant outfits. This is also a popular shopping time as almost all Siena's stores are open. The strollers often end their walk in the Piazza del Campo, where it is pleasant to sip an aperitif and watch the sun go down. As evening gently rolls in, you might find impromptu musicians or other entertainers in the square. This is a wonderful time of day to be outside, as the heat abates and the air cools. 8:00 p.m. is the dinner hour for many Sienese in the summer and around that time, restaurants tend to be busy. After dinner, there are a variety of bars and pubs where you can relax with a beer or glass of wine. 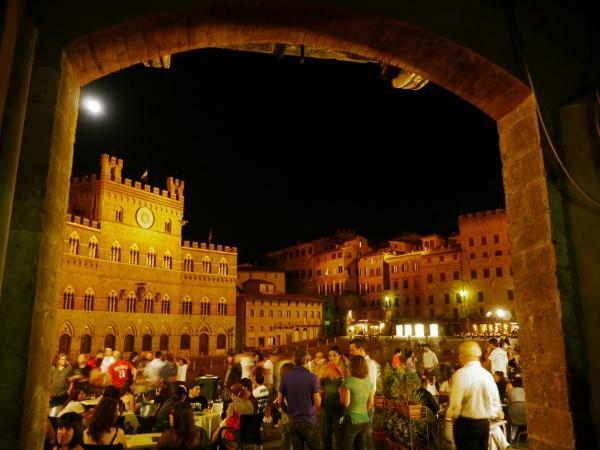 The open air cinema in the Medici Fortezza is also a popular late evening activity. This is a great opportunity to see recent films - and practice your Italian comprehension! Comedies, dramas, international and Italian films alternate nightly.